While we try lots of new recipes, there are some that are always on the menu… this duo is one of them. Super easy, flavorful and crowd-pleasing, they are extremely versatile and can served with vegetables and any additional protein of choice. 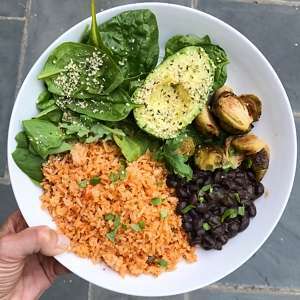 My plate: Rice, black beans, roasted Brussel Sprouts, fresh baby spinach and avocado. Mexican Rice recipe adapted from Test Kitchen, the rice is briefly cooked on the stove with some tomatoes, onions, jalapeño, garlic and vegetable broth, then baked in the oven. Quick Simmered Beans recipe from Minimalist Baker are seasoned with cumin & chili powder. Two of our favorites make the basis for a simple, delicious and cozy meal. Mexican Rice adapted from Test Kitchen. Quick Simmered Black Beans from Minimalist Baker. Toss brussel sprouts in oil. Spread in a single layer on baking sheet. Sprinkle with salt to taste. Bake for 30 minutes or until crispy.